For many school board members in the state, Sheli Dansky, New Jersey’s 2016 Board Member of the Year and a 26-year veteran of the River Edge Board of Education, needs no introduction. They may already know her as the small group leader from their new board member orientation program. Perhaps they know her from her decades of involvement with the Bergen County School Boards Association, where she just completed her term as president. Or maybe as a member of NJSBA’s Special Education Task Force, the Legislative Committee, as a Workshop presenter, as a delegate at NJSBA’s Delegate Assembly, or as a fellow board member taking the kind of advanced Board Member Academy training that has earned her the designations of Certificated Board Member, Master Board Member, and Certified Board Leader. Or it’s possible they know her from a myriad of other education-related activities. 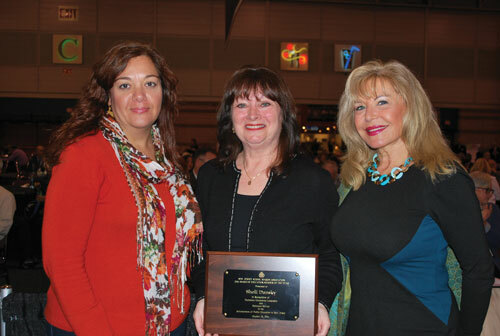 NJSBA established the Board Member of the Year award in 2005 to honor local board of education members whose work has had a positive impact on the education of the children in their communities and throughout New Jersey. An independent out-of-state panel reviews the nominations and identifies the individual who will be honored. Then, when her children were in elementary school, she got involved in the PTO, another traditional route to board service. “They had a position for someone who attended board meetings and reported back to the PTO on what happened, so I started going to meetings regularly and doing that,” she said. Challenges One big decision that came within Dansky’s first term was a search for a new superintendent, one of the biggest decisions for any board to make. But over the years, the River Edge board has had its share of other challenges as well. In the last two decades, River Edge’s population has grown steadily, and the district has had to grapple with all the issues that come with a rising enrollment , including adding space and instructional capacity to the district. “As our district grew, we had to do building projects, and getting those projects to happen was enormously challenging,” she says. One of the achievements that Dansky is most proud of in her two-plus decades on the board is the district’s “Building Bridges” program, which was created in 2007 to bring special education students with autism back into the district. The Secret to Longevity Why has she stayed on the board for all these years? According to Dansky, the variety of topics boards handle is endlessly interesting. “There is always something new and challenging happening. Just when I think I have seen it all…,” she says. “Seriously, at our last board meeting, something came up that I can’t give you specifics on but I thought – first, how is it possible we’re talking about this, and second, I thought I’d seen everything after 26 years.” Being a board member is never boring. But she has another motivation for staying on her board: her involvement as a group leader at NJSBA’s training sessions. “The other thing that has kept me on the board in moments when I was really ready to leave is the ability to be a group leader,” she says. As a group leader, Dansky spends two weekends a year training small groups at the weekend NJSBA New Board Member Orientation programs, which are held in January and March. The sessions, which are free to members and are limited to an attendance of about 100 at each session, feature both large group lectures, and then small group sessions where in-depth discussions are easier, and where leaders conduct various training exercises. Sheli Dansky’s professional life also involves helping children. She is a school-based physical therapist for two districts in Bergen County. She previously oversaw a staff of physical and occupational therapists in her own business, but now just works solo. She grew up on Long Island, and moved to River Edge in 1973 as a young wife, where she has lived ever since. Her children all went through the River Edge schools, and now three of her grandchildren are students there. Being chosen as Board Member of the Year was both gratifying and humbling, according to Dansky. Sheli Dansky cites a quote that she thinks is perfect for a board member to always keep in mind. It was attributed to Albert Einstein, for whom school did not come easy when he was young. The quote is: “Learn from yesterday, live for today, hope for tomorrow.” She has spent the last 26 years living those ideals. 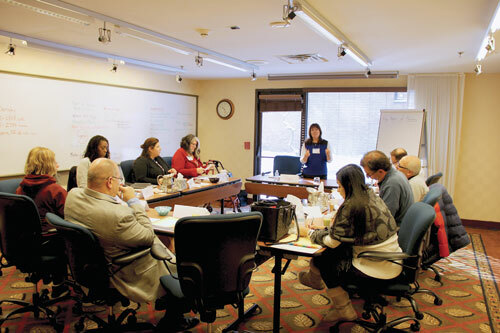 Sheli Dansky leads a small-group exercise at the weekend New Board Member Orientation program. After receiving her Board Member of the Year Award at Workshop, Sheli Dansky (center) with River Edge Board President Paris Myers (left) and Dr. Tova Ben-Dov, superintendent (right). Janet Bamford is NJSBA manager of communications and publications.